“Monroe’s Hornpipe” has been a standard tune in jams since before it was released on vinyl. The tune was originally recorded by Bill Monroe in 1958 but wasn’t available until the release of Bluegrass Instrumentals (Decca DL 4601) in 1965 with Bobby Hicks (fiddle), Robert Lee Pennington (banjo), Jack Cooke (guitar), and Bessie Lee Mauldin (bass). A recording of a jam session at the 1966 National Oldtime Fiddlers’ Contest in Weiser, Idaho, features a 21-year-old Byron Berline (who had won the contest the year before) playing “Monroe’s Hornpipe.” According to bluegrass historians Neil Rosenberg and Charles Wolfe, in addition to the delayed release, Monroe had worked on the tune and performed it for a long time before recording it. During this time, many young bluegrass fans, like Byron, must have heard and learned the tune for themselves. The Weiser recording can be found on Fiddle Jam Session (Voyager VRLP 301). Terms like “reel,” “jig,” “schottische,” or “hornpipe” refer to a particular phrasing in tunes that often corresponds to a type of dance. As time has gone on, the connection between folk song and dance has loosened in America and as a result, many musicians in the States do not or cannot distinguish between these sorts of tunes. Hornpipes and reels are especially difficult as they are often in the same time signature (4/4) and while reels are played with a straight eighth note feel that emphasizes the second and fourth beat of a measure, hornpipes are traditionally played with a dotted eighth note feel that emphasizes the first and third beat of the measure (or in other words, reels swing while hornpipes bounce). However, without dancers to be concerned about, musicians in the States often straighten out the rhythm of hornpipes, making their differences more difficult to discern. When danced to, hornpipes are actually played slower, which brings out their natural lilt. Despite this, Monroe’s tune does loosely fit the structure of other New England Hornpipes, though with an obvious bluegrass feel. Benny Martin claims that the tune is based on “Big-Eyed Rabbit” but, while there are many different versions of this tune that might sound more or less like it, “Monroe’s Hornpipe” stands as a unique melody. 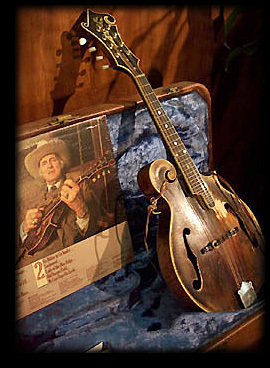 Monroe’s original recording of the tune is also interesting because rather than his famous 1923 Loar-signed Gibson F5, Bill is playing an oval hole F4-style mandolin. Bill owned a variety of mandolins throughout his life and would often be seen playing one when he was having repairs done to his main mandolin. Bill did own an F4 mandolin at this time but he also might have been borrowing Connie Gately’s, who played with the Blue Grass Boys around the time this track was recorded. I had hoped to take a video of this tune while I was in England, the home of hornpipes, but I couldn’t find a chance while on tour. I did find a moment while playing at the La Roche Bluegrass Festival in southern France. Here’s me playing a hasty interpretation of “Monroe’s Hornpipe” based on no version in particular with a missing string on top of the old tower in La Roche Sur Foron overlooking the shockingly warm French Alps. Hume, Colin “Hornpipes.” 16 May 2016. Web. 5 Jul. 2017. Wikipedia Contributors. “Hornpipe.” Wikipedia, the Free Encyclopedia. Wikimedia Foundation, 1 Jul. 2017. Web. 5 Jul. 2017. Beanstalk “Trying to explain the difference between a jig, reel and hornpipe..” 8 Apr. 2010. Web. 5 Jul. 2017. List, Contributor. “Various - Fiddle Jam Session (Vinyl, LP, Album) at Discogs.” Discogs. n.d. Web. 5 Jul. 2017.
eBay. “1SR VOYAGER VRLP-301 FIDDLE JAM SESSION BILL LONG BERLINE YOHEE WILES PEERCE .” eBay. n.d. Web. 5 Jul. 2017. Nusbaum, Philip. “Review of: Fiddle Jam Session (Lonnie Peerce, et al. ; Voyager); More Fiddle Jam Sessions (Bill Long, et al. ; Voyager); and Twin Sisters (Vivian Williams and Barbara Lamb; Voyager).” Oct. 1976. Web. 5 Jul. 2017. Mandolin Cafe “What is a Hornpipe?.” Mandolin Cafe Forum. n.d. Web. 5 Jul. 2017. Phil Williams. “Fiddle Jam Sessions.” Voyagerrecords.com. 3 Mar. 2013. Web. 5 Jul. 2017. N.a. “Grateful Dead Family Discography: Monroe’s Hornpipe.” 19 Mar. 2014. Web. 5 Jul. 2017. Pennell, Charley “Bluegrass Discography: Viewing full record for Bluegrass instrumentals.” n.d. Web. 5 Jul. 2017. Wikipedia Contributors. “Benny Martin.” Wikipedia, the Free Encyclopedia. Wikimedia Foundation, n.d. Web. 5 Jul. 2017. N.a. “Blue Grass Boys: Alphabetical Index.“ Doodah.net. 10 Sept. 2012. Web. 5 Jul. 2017. National Oldtime Fiddlers Contest & Festival. “History.” National Oldtime Fiddlers Contest & Festival. 20 Jan. 2013. Web. 5 Jul. 2017.